If you have been involved in a car accident, you may have to deal with an individual who tries to deflect responsibility for the accident. No one likes to take the blame for car accidents, and you may be faced with someone who does not want to shoulder all the blame for yours. A New Jersey personal injury attorney may be able to help you deal with these claims and the insurance company. In general, when you file a car accident lawsuit, the defendant named will likely have one of three responses: (1) they will claim the accident was your fault, either entirely or partially; (2) they will claim the accident was the fault of a third party; or (3) they will claim that you were not really injured in the accident. Most commonly, the defendant will claim you were responsible for the accident, or, in legal terms, that you were contributorily or comparatively negligent. This means that your negligence was partially responsible for the accident or that your negligence should be compared against the defendant’s negligence. The defendant might try to claim that you were speeding or in violation of another traffic statute. The defendant might also argue that there is something you could have done to reduce your injuries or avoid the accident entirely, such as wearing your seatbelt or swerving your car to the side. The defendant might argue that even though he was partially negligent in contributing to the accident, you also had partial, if not greater, negligence. The defendant might claim comparative negligence in another way, which is that someone else besides you and him/her is partially responsible for the accident. The defendant might claim that the roads were unsafe and should have been better marked and protected by guardrails. Or the defendant might claim his or her vehicle was faulty in some way, or that a third driver triggered the accident. The defendant might challenge the injuries you claim you suffered by claiming that: (1) you were not hurt as much as you claim; or (2) you were injured prior to or after the accident and so the defendant is not responsible for your injuries. 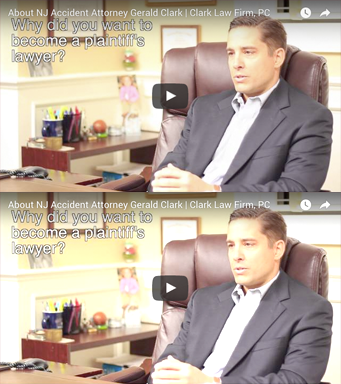 Contact an experienced New Jersey personal injury attorney at the Clark Law Firm for more information on how to deal with a defendant who denies responsibility for a car accident.